Wagner calls for a wooden trumpet in Act Three of Tristan und Isolde, the holztrompete. Trumpeter Justin Emerich plays this instrument, which was loaned to Seattle Opera by the Joe and Joella Utley Brass Instrument Collection at the National Music Museum, The University of South Dakota, Vermillion SD. Justin stopped for a photo (and a brief chat) on his way to the pit the other day. Have you ever played a wooden trumpet before? What instruments do you play other than trumpet? No, this is my first time with the wooden trumpet. I play lots of different kinds of trumpet: piccolo trumpet, flugelhorn, cornet, bugle; and I did once play French horn in a performance, where we all switched instruments. French horn and trumpet aren’t so different you can’t figure it out. The wooden trumpet reminds me of playing the natural trumpet or Baroque trumpet, this instrument with holes instead of valves. What’s the trickiest part about your solo in Tristan und Isolde? 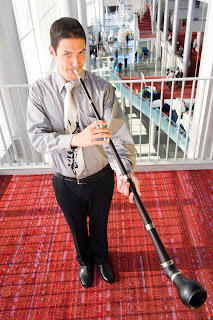 One of the things that’s interesting is that, since I’m offstage, where I’m supposed to be this Shepherd playing on a pipe, I have to aim the pitch a little high—things tend to go flat over the extra distance, it’s a sort of Doppler effect. With symphonies we do the same thing when we play offstage in Mahler 3 or The Pines of Rome. And, obviously, you have to play much louder when you’re backstage…I’m trying to play as loud as I can, pointing the bell out through some curtains. Have you played Wagner before?At Seattle Opera I’ve played the Ring in ’05 and ’09, plus Flying Dutchman in ’07. Plus the two International Wagner Competitions [in ’06 and ’08], doesn’t that count? I played with the Metropolitan Opera when I lived in New York, but no Wagner…although we did play Richard Strauss, Die Frau ohne Schatten. That was crazy! 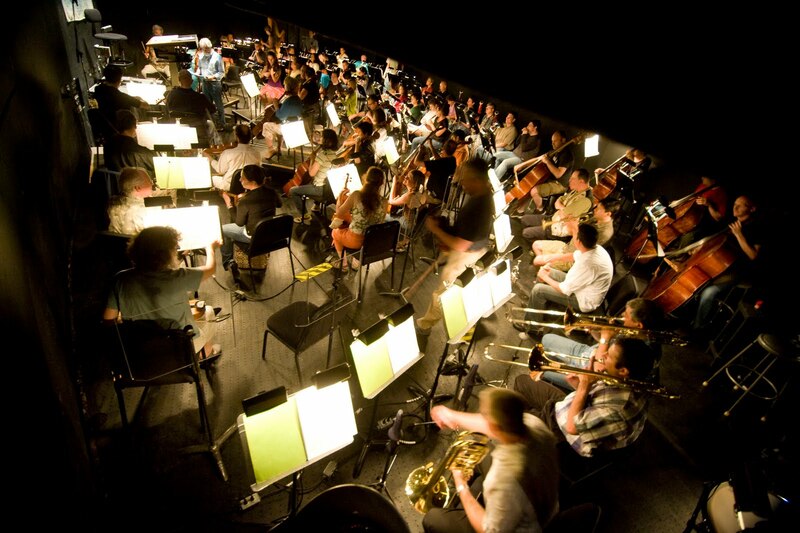 It was my first time in the pit with that great orchestra, I was so jazzed up. The Seattle Opera orchestra pit at a Tristan rehearsal. Justin, wearing a white shirt, sits in front of the double basses. Speaking of jazz, you’ve played classical and jazz, you’ve played with the Canadian Brass…what’s your favorite kind of music to play? I used to play a lot more jazz than I do now. But I do know how to improv, I did quite a lot of it. Coming out of high school I wanted to be a jazz musician. But my teacher convinced me to keep studying: “You’re going to be a classical musician!” Eventually I fell in love with the repertoire, and put jazz on the back burner. Currently I play in a group called Burning River Brass, out of Cleveland, 11 players, we’re more of a standard concert group. Sometimes I try to talk them into doing one jazz chart as an encore, so I can play some high notes! 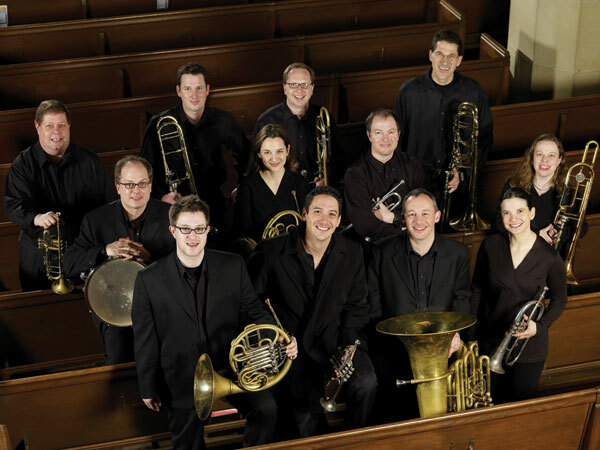 Burning River Brass, Justin Emerich second in the front row. You’ve lived in Florida, Michigan, Seattle…who is more itinerant, a singer or an instrumentalist? I’m not a full-time member of the Seattle Symphony, and I’m lucky to have the freedom to can travel a lot. Just this year so far I’ve played in San Francisco and as guest principal with orchestras in Seoul, South Korea, as well as Jacksonville, Florida…not to mention touring with my brass groups, Proteus and Burning River. Although as I get older, I may need to scale that back a bit. Where would you like to settle down? I love Seattle, love being here on the west coast. But I grew up in California, my family is still there, and my dream orchestra since I was a kid is San Francisco. It’s a great orchestra, it’s a wonderful hall…I guess that’s always been at the back of my mind. Would be wonderful to post a video of the instrument being played before you have to ship it back. Hallo, Jack, Jon, and Others! A very informative interview!! 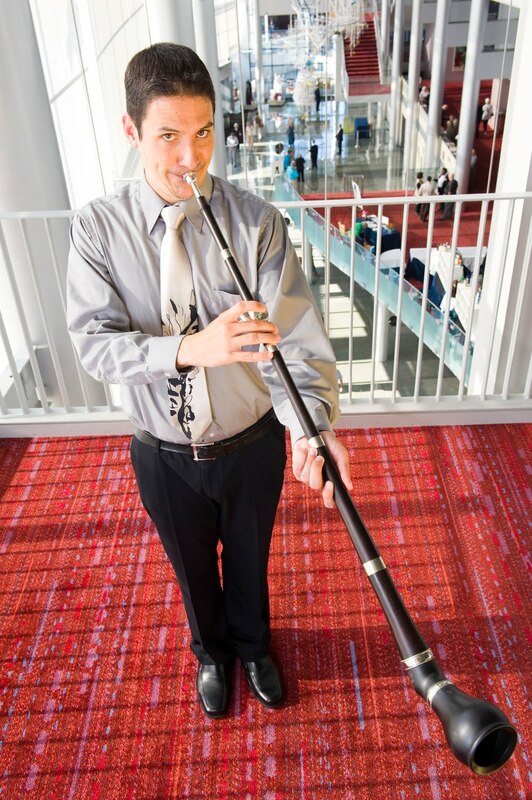 From the looks of the instrument, it appears to be more woodwind (even made of wood) than a brass instrument -- and as the musician says, it has holes, not valves. 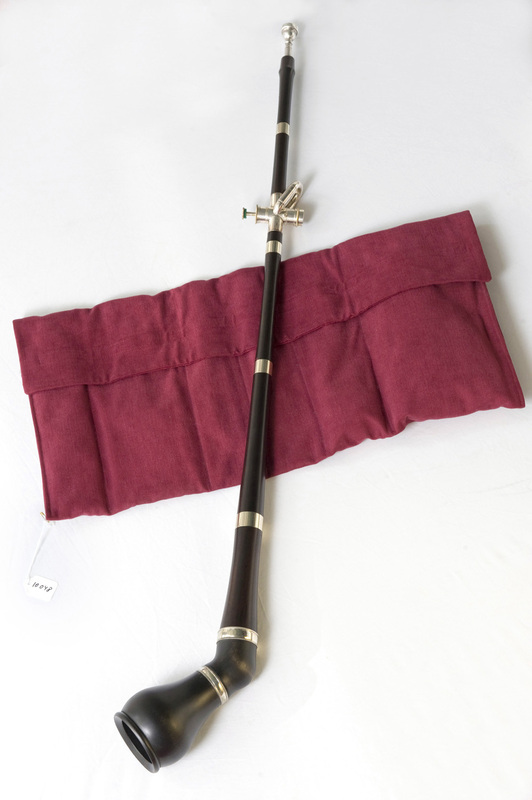 Plus it looks like an oversized English horn. His love of the San Francisco Symphony is one I shared as a child, too. I often took the Greyhound up to Frisco for its concerts and then back down to LA in time Monday morning for school.